There aren’t many occasions when shoppers spend as much money as they do on a new vehicle, which is why a model needs to offer the perfect arrangement of benefits that will combine to fit every need. Many people find just such a vehicle in the 2016 Volkswagen Golf in Las Vegas NV. Not only is the model a stylish option, but offers a surprising amount of space. Its compact size also makes it easy to park, especially combined with its tight steering. This makes it a smart option for new drivers. Not much is more frustrating about compact cars than some of weak powertrains offered, but this isn’t a problem in the 2016 Volkswagen Golf, as the 1.8-liter engine returns 170 horsepower. This means acceleration is smooth and comfortable. The seats have also earned high praise for being supportive, giving an all-around cozy feel to the high-quality interior. When it comes to building a solid design, the VW Golf has benefitted from its decades on the market as it only gets better with each generation. The Golf is a favorite with drivers not only because it offers practical features, but also manages to be a fun drive. A 1.8-liter turbocharged engine delivering up 170 horsepower and 184 pound-feet of torque. Combine this with strong breaks and tight steering for the perfect combination of practical and fun. There can be little doubt one of the main reasons behind purchasing a hatchback is the improved cargo space. Seats fold down flat for complete use of the available interior space, bringing the maximum cargo space to 52.7 cubic feet. With the seats upright, it still has a total of 22.8 cubic feet to work with. A low starting price is important, but so is having all the conveniences modern vehicles can offer. 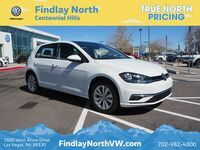 The Golf offers a nice balance with standard features including a rearview camera, heated side mirrors, a 6.5-inch color touchscreen with App-Connect features and a multi-function steering wheel. Though a complete redesign was offered for the previous model year, the 2016 Volkswagen Golf has earned some new features that have made it even more appealing. Some of the chief complaints against the last year’s offering were against its available driver assistance features and the older infotainment system. This year Volkswagen has released the all-new MIB II infotainment system, which is now available Volkswagen Car-Net App-Connect. This feature include integration of Android Auto, Apple CarPlay and MirrorLink to provide some of the best smartphone connectivity on the market. This model year the 2016 Volkswagen Golf is offered in both two- and four-door body styles, but the two-door trims are available by order only. The App-Connect feature is standard on S and higher trims, which means it is available on all four-door options. Those seeking improved driver assistance features will also find them available in the optional Driver Assistance package, which includes forward collision warning, autonomous emergency breaking, lane departure warning, parking steering assistant, adaptive cruise control and park distance control. Models equipped with this package have earned a Top Safety Pick+ rating from the Insurance Institute for Highway Safety. 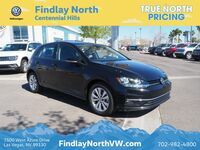 The 2016 Volkswagen Golf is available at Findlay North Volkswagen serving Henderson and Las Vegas, NV. Schedule a test drive online or stop by the dealership to see if this is the right model for you. Interested in a 2016 Volkswagen Golf?